Enable Ability are going to be implementing some really positive changes in the New Year, therefore we are delighted to announce that the local Copnor-based charity, who work with disabled people of all ages, will be launching a new website which will be easy to navigate and will showcase the many services the charity provides for people in Portsmouth and the surrounding areas. Our recent news is that Enable Ability have taken over a local charity, the Portsmouth Autism Support Network, commonly known for its abbreviated name of PASN. Since the merger in October 2018, Enable Ability have been working closely with parents, service users and other organisations through a period of consultation due to end in March 2019. In April, the charity hopes to have a much clearer picture of how to take PASN forward without too many changes. Until then, please follow the PASN Facebook page or join the Enable Ability mailing list; details of how to join this are detailed at the bottom of this article. Most services provided by Enable Ability remain the same, however there were some changes that took place in April 2018 due to a shift in local authority funding, a new project named the Portsmouth Teenage Project was created specifically for young people in Portsmouth aged 13-17 years old with mild to moderate disabilities. The Portsmouth Youth Project remains strong for our young people aged 18-25 years old with a more work-focused element to weekly activities. With the introduction of the new website, Enable Ability are renaming some of their projects to give a little more clarity on the ages of the groups, for example; junior, teenage and youth. The charity also plans to support Dan Davies and his Bivol Trust in the New Year; this is predominantly for adult-focused activities. 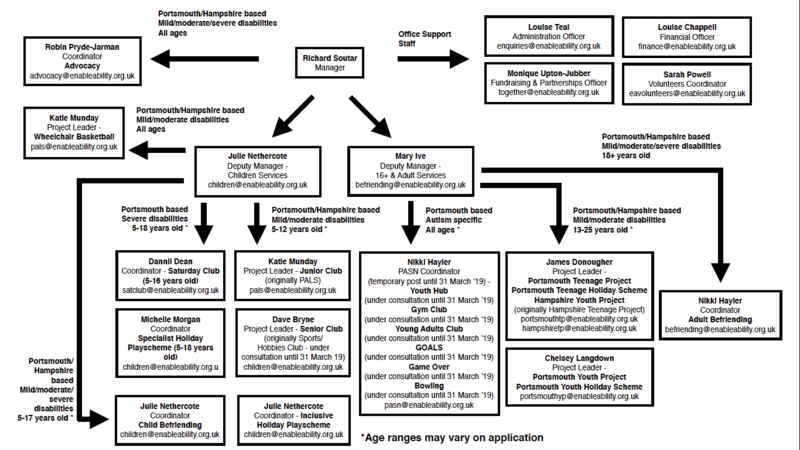 Enable Ability hopes the chart below will help to eliminate any further confusion with regards to the recent changes, the staff are excited to reveal their new website which should give even more clarity to the many services the charity provides. The year of 2019 will prove to be a major milestone in the charity’s development over its 68 year history, Enable Ability plan to invest the largest amount of money into a social enterprise project which will have a really positive impact on residents in the local community… watch this space. To keep updated with the latest news, please email enquiries@enableability.org.uk and join Enable Ability’s social media pages on Facebook, Instagram, Twitter and LinkedIn. Alternatively, Enable Ability will be attending every coffee morning hosted by Portsmouth Parent Voice in the New Year for those who prefer speaking to someone in person.